Shop Artemide lighting at Stardust. Artemide is famous for a range of well known designs in the lighting industry that display a good sense of style including the Artemide Tolomeo table light and the elegant Artemide Logico suspension light. The company was founded in 1956 in Italy and has become legendary for its inventive illumination. Artemide has worked with significant designers past and present such as Michele De Lucchi, Ross Lovegrove and Ron Rezek. Artemide Lighting Design on display at Stardust. One of the most prominent and respected lighting companies in the world today is Artemide. Discover the Artemide Store at Stardust; we display a wide selection of Artemide lighting fixtures at our showroom in Sonoma, California. Every lamp is designed by a notable architect or designer and is manufactured entirely in Italy. Several iconic lamps of Artemide have drastically enhanced the home- and office landscape especially its finest Tolomeo Table Lamp: the designers lent their expertise in doing the overall design, while Artemide weaved its magic on the structure itself. Artemide is the quintessential design-oriented Italian lighting manufacturer. Founded by Ernesto Gismondi and Sergio Mazza in 1960 as both a lighting and furniture manufacturer, the company has grown to become the most perfect and typical example of Italian design quality and class.Stardust Modern Design is proud to be an official Artemide lighting retailer. We are passionate Artemide collectors ourselves and often exhibit a wonderful collection of rare out-of-production Artemide design classics.Stardust often displays vintage Artemide products such as 'Dedalo' from 1966, Angelo Mangiarotti's Lesbo Table Lamp from 1967 and Mario Botta's Shogun Table Lamp from 1986 with its 1980s postmodernblack & white striped design. Since it was founded more than 50 years ago, Artemide has showcased the most innovative lighting and world-class design, with a desire to contribute to the transformation of the domestic Italian lighting landscape into a global brand. Based in Pregnana Milanese, a suburb of Milan, the company specializes in the production of lighting and continues to make each lamp in Italy. For each of its creations, Artemide engages world-renowned architects and designers to work on the engineering and design to make an outstanding lamp in the end.Each Artemide lamp exhibits an interesting fusion of practical and sophisticated design.The company receive world-wide acclaim for the classic Tizio desk lamp designed by Richard Sapper in 1972 and the Tolomeo desk lamp, designed by Michele De Lucchi and Giancarlo Fassina in 1986.Other designers who have collaborated with Artemide include Naoto Fukasawa, Sir Norman Foster, Michele De Lucchi, Vico Magistretti, Alessandro Mendini, Richard Sapper, Ettore Sottsass, Enzo Mari, Neil Poulton, Karim Rashid and Ross Lovegrove.Artemide has won numerous awards, including the Compasso d'Oro award for lifetime achievement in 1995 and the European Design Prize in 1997. In 2006 Artemide won two Best of The Best Red dot design awards for lamps designed by designer Neil Poulton and by architects Herzog & de Meuron.Exceptional in every way, Artemide's extensive collection of modern lamps can be found in permanent museum collections, including the Musée des Artes Décoratifs de Montreal, The Metropolitan Museum of Art in New York, The Museum of Modern Art in New York and the Galleria Nazionale d'Arte Moderna in Rome. Stardust is proud to be the official retailer of the Artemide lighting collection.Artemide's contemporary modern lighting collection includes glass chandeliers, modern wall sconces, designer lighting fixtures for ceiling and wall, desk and table lamps and stylish floor lamps. Throughout its history, Artemide has attracted the best names in the design industry. Artemide designers include Michele De Lucchi, Livio Castiglioni, Gianfranco Frattini, Vico Magistretti, Richard Sapper, Ron Rezek and Giancarlo Fassina. Artemide's lighting products are much more than highly refined design objects, ensuring a top technical performance – they are objects born from man’s experience to satisfy man’s needs. Artemide produces some of the most iconic Italian light fixtures that transcend time and have become legendary in their own right.Artemide is known for creating some of the world's most imaginative lamp designs that are celebrated not just for their aesthetic magnificence, but also for their functional significance in both home- and officeenvironments. Artemide is a leading Italian lighting manufacturer. The Artemide lighting collection contains some of the most celebrated decorative and architectural lamps in history. Some of them even made it to the permanent collection of the Museum of Modern Art in New York. The Artemide collection of modern lamps for the home and the office embraces both style and function. The Artemide lighting catalog includes the world-renown Tolomeo lamps, the Artemide Mercury Lamp, Nesso Table Lamp, Logico Ceiling Lamps and the the classic Tizio desk lamps along with a large selection of table lamps, task lamps, wall lights, ceiling light fixtures, floor lamps, recessed lighting, wall ada and outdoor lighting. 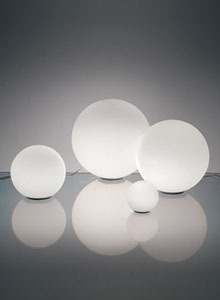 Stardust is the official Artemide lighting store and offers guaranteed low pricing on the entire Artemide collection. Many lamps from the Artemide collection are on permanent display in our Sonoma showroom. Our knowledgeable Artemide lighting experts will be happy to answer any questions you may have. Learn even more about the design history of Artemide. Artemide: Design Icons, Cult Objects & Design Classic. At Stardust we celebrate the instantly recognizable Artemide Classics from the most significant designers past and present. Some of the early designs (most of them are currently out of production) include the Delta lamp (1960), Bacco bar cart (1967), Selene Chairs (1968), Chimera lamp (1969), Dania lamp (1969), Eclisse lamp (1970), Gaudi Chairs (1970) and Mezzopileo lamp (1972) Some of our personal favorites include classic Artemide lamp designs such as Masayaki Kurosawa's free-flowing Lavinia lamp (1965), the Dedallo umbrella Stand (1966) and the iconic 1980s classic: Mario Botta's Shogun Lamp (1986). If you are visiting- or living in New York, make sure to stop by at the Artemide Store in SoHo. The Italian lighting manufacturer Artemide opened its first American store in SoHo during the 1990s and it has become a real SoHo destination. The Artemide NYC store carries the company's most popular lighting fixtures, including classic models like the Tolomeo table lamp and the Artemide Logico Suspension Lights, by Michele De Lucchi and Gerhard Reichert, as well as more recent pieces like Ross Lovegrove's Mercury Ceiling Lights modeled after liquid drops of mercury. The Artemide SoHo Store can be found at 46 Greene St, New York, NY 10013. The Artemide SoHo Hours are 11:00 am – 5:00 pm every day including Saturday (closed on Sundays). Artemide San Francisco is currently closed. Customers who are looking to purchase Artemide lighting on the West Coast and the San Francisco Bay Area can purchase Artemide Lighting from modern design purveyor Stardust. Stardust is the official lighting store from Artemide Inc. Discover contemporary lighting by Artemide consisting of decorative and architectural lighting, imported from Italy. Artemide San Francisco, home to some of the most important Italian lamps in the world will be re-opening soon at a new location. We encourage Miami lighting store customers to visit the amazing Artemide Miami Showroom which has the best Artemide lighting in display. Artemide lighting Miami's showroom location is at 2222 Ponce De Leon Blvd #100, Coral Gables, FL 33134.All other customers, please shop Stardust for Artemide Lighting including the classic Tolomeo Desk Lamp and Tizio plus Modern Floor Lamps & Pendant Light Fixtures with Free Shipping plus a 110% Price Match Guarantee.